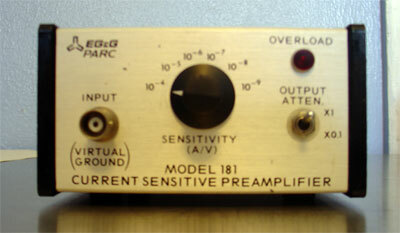 The model 181 is a current-to-voltage preamplifier of low noise and low input impedance designed to amplify the extremely low low currents encountered in such areas as photometry and semiconductor research. In photometric applications the low input noise allows the use of photo detectors with dark currents as low as 10-14 A/root Hz, while the wide frequency range permits high modulation frequencies to avoid 1/F noise and power-line pick-up. 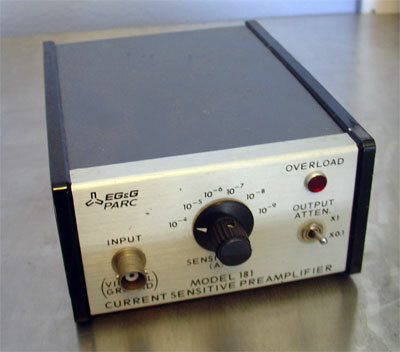 The unit can be powered from an external low voltage, a lock-in amplifier via a suitable power cable, or the models PS0055 or PS0056 remote line power supply modules. 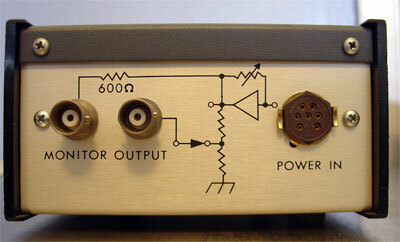 Gain 10-4 A/V to 10-9 A/V in six ranges. Unit is in excellent physical and electrical condition.